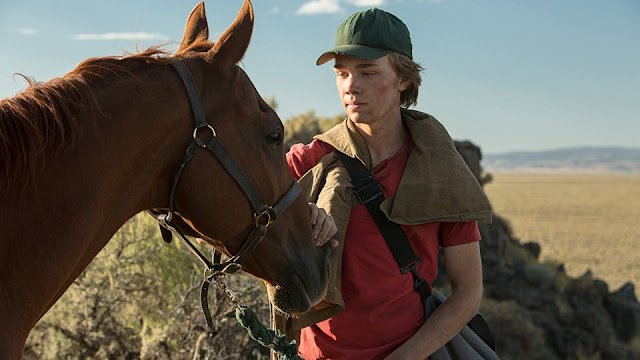 Working from a novel by Willy Vlautin, Haigh in Lean on Pete makes the boy and his horse story his own, which means stripping it of the mystical element and rendering it completely realist. The premise is recognizable, but the narrative is stark. Charley (Charlie Plummer) is a sixteen-year-old motherless kid who follows his itinerant, hard-drinking father, Ray (the Australian actor Travis Fimmel), across the Pacific Northwest looking for work. After they land in Portland, Oregon during the summer, Charley stumbles upon a job with Del (Steve Buscemi), an ornery horse trainer at the bottom end of the racing circuit. Charley works hard and without complaint, earning Del’s respect and the affection of his favorite jockey, Bonnie (Chloë Sevigny), and he’s happy to bring money home to help out his dad, to whom he’s devoted. But when Ray starts sleeping with a married woman, her husband comes after him with a knife. Ray dies in the hospital and Charley’s attachment to one of Del’s horses, Lean on Pete, acquires a desperate quality. The boy romanticizes the animal’s prospects; in fact, Lean on Pete is failing (thanks to a bad leg). When he learns from Bonnie that Del plans to get rid of him, Charley makes off in the middle of the night with the horse and its trailer, with the vague intention of finding his aunt in Wyoming. The sparse money he has from his salary doesn’t take him far, and though he encounters a few kindhearted folks along the way, things go from bad to worse. In The Black Stallion, the magical horse, The Black, rescues the boy, Alec, from the shipwreck off the Arabian Coast that claims his father and, in emotional terms, substitutes for the missing father until Alec can return to the civilized world. (At that point it’s Alec’s turn to find some way to create a link between the horse, an emblem of pre-civilized freedom, and the world the boy needs to rejoin.) It’s a fairy tale in which the child’s loss and grief are represented metaphorically and his wonderful, improbable friendship with the horse has healing powers that are simultaneously metaphorical and real. A realist version of this sort of coming-of-age story can’t work on the metaphorical level; it has to answer for the howling grief a sixteen-year-old boy would feel after losing the father he adores, and for the way that grief would naturally unmoor him. The blows that Charley takes – the death of Lean on Pete in an awful, grotesque car accident; homelessness; being robbed by a man named Silver (Steve Zahn) who befriends him at a shelter – exacerbate what is clearly post-traumatic stress from Ray’s death. I think Lean on Pete is a fine movie, but it’s brutal, because Haigh knows he can’t mediate the grimness of the story without compromising it, and you can see from his previous work (including Weekend, which preceded both 45 Years and the TV series and TV movie Looking) that he seems to be incapable of compromise. The scene where the horse is hit by the car isn’t gratuitous, and I’d even say that there’s a poetic quality to the way Haigh and his cinematographer Magnus Nordenhof Jonck shoot it, but it made me cry out involuntarily in the theatre. Haigh makes a point of filming the violence that erupts after Charley comes back to Silver’s trailer for the money less graphically than he might have, emphasizing the chaotic nature of the encounter rather than the details; it’s one scene that doesn’t work (it’s mostly confusing), though I was grateful for Haigh’s impulse not to give us more than we can handle. At the end of the movie Charley does, against all odds, track down his Aunt Margy (Alison Elliott), and the fact that, after all he’s been through, he gets to stop running and settle down someplace is affecting in a way that’s difficult to describe. I couldn’t stop weeping – in relief, yes, but not because I had the feeling that everything was suddenly going to be OK for this kid who was still staggering from all he’d been through. The presence of actors like Buscemi and Sevigny and Zahn – and Alison Elliott, whom I loved so much in The Wings of the Dove but have seldom seen since – is a boon to the film, but Charlie Plummer has to carry it. He’s in every scene, and the movie is tuned to his sensory equipment. I thought he was very good as the kidnapped John Paul Getty III in All the Money in the World, but here he pulls off something truly amazing: a two-hour performance of almost uninterrupted heightened emotion without a moment of ego or self-indulgence. This isn’t a word I often feel drawn to use to describe an actor, but there’s a purity to Plummer’s performance. It helps, of course, that he’s working with a director who instinctively rejects dishonesty of any kind. Lean on Pete couldn’t work at all, it seems to me, if actor and director weren’t on the same wavelength.